Happy (Day After) Earth Day, everyone. Did you get outside yesterday and march to support scientific reasearch in all its manifestations? Or perhaps you took a wet walk through some of the BLT’s properties? 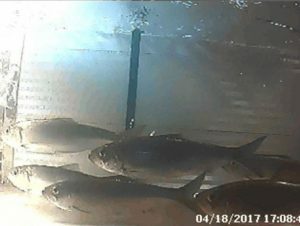 The week ending on April 18 saw the fish counter at the Branford Supply Ponds posting a remarkable 1,798 alewives going up the fishway. At this early point in the season, we have already surpassed lat year’s total. However, it is such a large increase that the possibility of a fishcounter error seems likely. Were you at the Supply Ponds this past week? 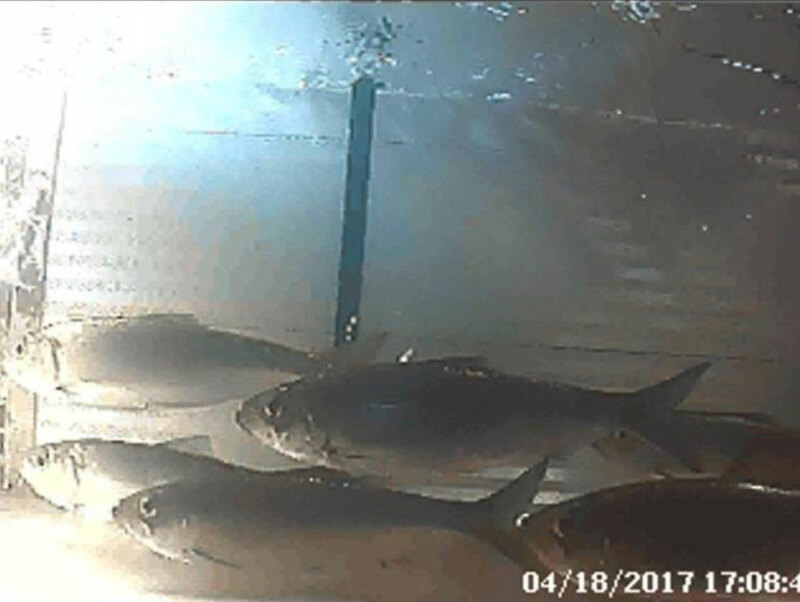 Did you see the alewives? Let us know. 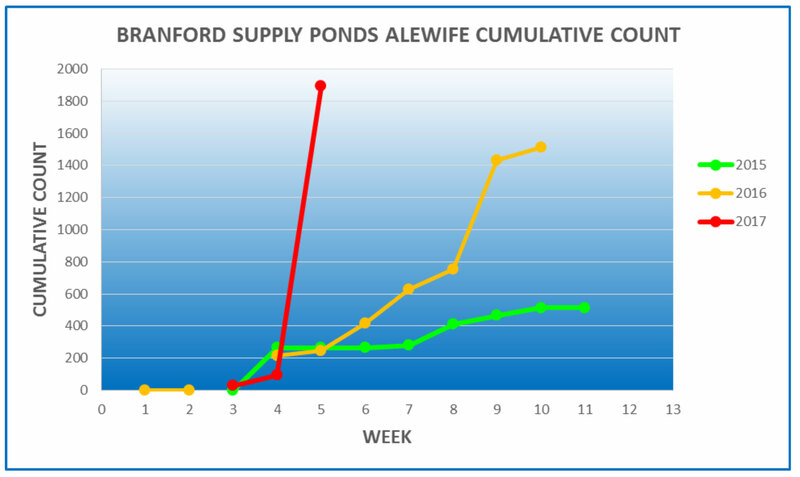 This is the time of year when the Supply Ponds’ alewife count usually begins to climb in earnest. 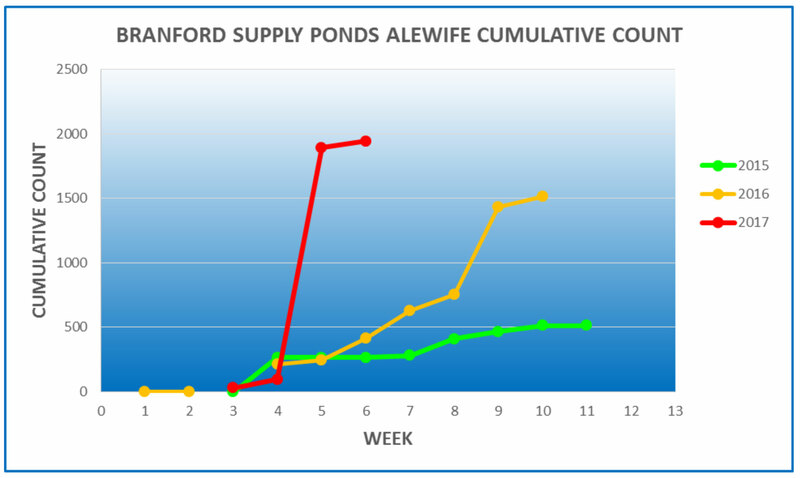 Last week, the fish counter posted a very modest tally of 50 fish going up the fishway. However, coupled with the remarkable total posted on 4/18 (a count which must still be taken with a grain or two of salt), the year-to-date total stands just under 2,000 fish. In case some of you, like me, have never seen alewives migrating up Connecticut’s riverways, here is a photo of a group passing up the Bunnells Pond Fishway on the Peqonnock River in Bridgeport. Photo from the Connecticut Weekly Diadromous Fish Report (DEEP).